This Instant Pot vegetable soup is a delicious, one-pot meal made very easy by using an electric pressure cooker. I first saw and fell in love with Herman on Facebook. A friend reposted his photo after it had appeared on the Facebook page of CARA–Community Animal Rescue and Adoption (the same group my daughter E volunteered for in high school). Later that day, E and I tuned in to the local news to see Herman as the Pet of the Week, and we just knew he was meant to be part of our family. We rushed to the shelter, hoping to get there before all of the crowds of people who were sure to want Herman, and we did. Herman turned out to be a sweet, joyful older dog who gets along great with cats (by “great” I mean he totally ignores them). We were able to bring Herman home with us that day, but not before being told a few depressing truths. Herman has heartworms, and the treatment for them is not easy. He’ll have to be kept quiet for weeks–no activity that could get his heart rate up or cause him to pant. Right now, he’s having some other health issues that we’re trying to get under control before we put him through the heartworm treatment. Herman has had a bit of a hard life. He was obviously someone’s pampered pet, but he was found close to death after having been attacked by a larger animal. The vet didn’t think he would survive, but to meet Herman is to love him, so CARA insisted on paying for his surgery and treatment. They nursed him back to health and sent him home with an adoptive family–who brought him back a few months later! We don’t know why (he is seriously the easiest dog to care for) but we’re glad because it gave us the opportunity to make him part of our family. He especially loves his sister E.
I have a lot more info and many photos of Herman on my personal Facebook page. His photo album is open to the public, so if you like Herman, you can see more of him here. Last month, Amazon had a sale on Instant Pots, and a lot of my readers purchased one through my affiliate link (THANK YOU!) I heard from a few that they were intimidated to use the IP for the first time, and they suggested I write a tutorial or do a video. Well, it’s taken me a while to get it done, but I’ve finally made a video of one of the easiest meals I make in the Instant Pot. 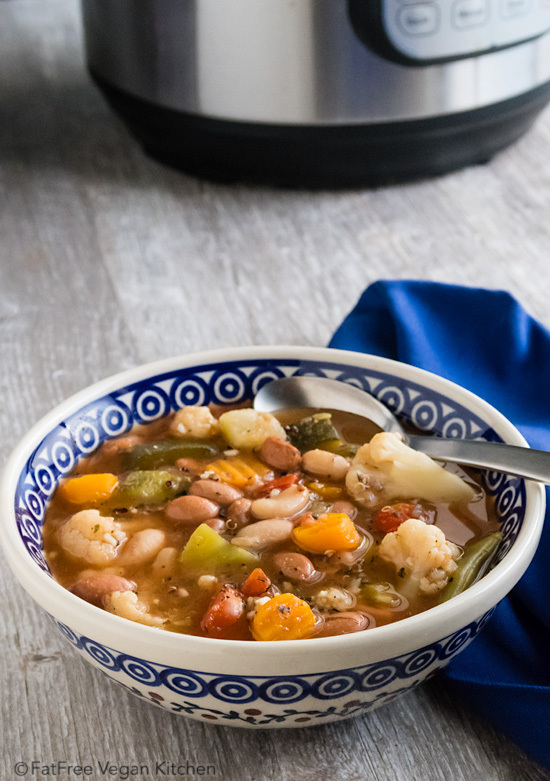 I say “meal” because this soup has it all–vegetables, beans, and grain–and is a perfect one-pot meal. It’s a version of my Dirty Little Secret Soup, but using the Instant Pot means I can dump in all the ingredients and walk away until it beeps. Check out my video! From start to finish, it takes about an hour (less time if you use thawed vegetables), but the beauty of the Instant Pot is that you don’t have to stand over the stove, stirring and adjusting the heat. If you don’t have an IP, you can still make this soup with a little extra water, but I recommend following the Dirty Little Secret Soup recipe. Need more Instant Pot recipes? I have over 50 of them here! You can use any blend of vegetables you like, including fresh vegetables. I just like the ease and convenience of frozen. Add all ingredients to the Instant Pot or other electric pressure cooker. Stir. Secure the lid and set the vent knob to Pressure. Choose Manual or High Pressure and set the time to 2 minutes (use the minus button on the IP). The Instant Pot will turn on and pressure will begin to build (this can take a while, from 15-30 minutes, depending on the temperature of your ingredients). When high pressure is reached, the counter will change to 2 and begin counting down. When it beeps, use the Cancel or Off button to turn off the cooker. Very carefully, turn the vent knob to Steam (or use whatever quick steam release your cooker provides). To be extra careful, you can use a long-handled spoon to turn the knob so that you don't risk being burned by the steam. When the steam has all been released, the Instant Pot will unlock so that you can remove the lid, carefully angling it so that you don't get steamed. Stir the soup. If you'd like it to be thinner, you can add water or vegetable broth. Check the flavor and add more seasoning as necessary. Stir in 1-2 tablespoons of nutritional yeast before serving. Add a handful or two of fresh baby spinach and allow to wilt just before serving. 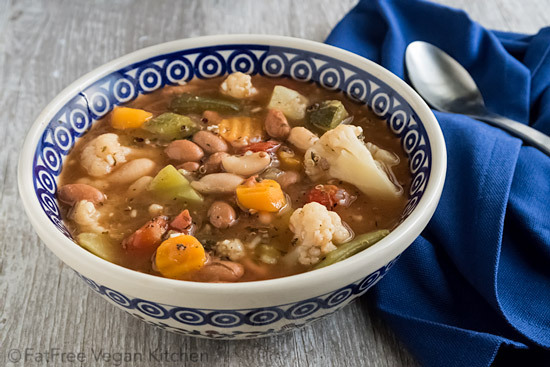 I used the liquid from the canned beans because I find it results in a richer broth, but if you prefer to use water or vegetable broth, drain the beans, measure the liquid, and replace it with water or broth. The slowest part of Instant Pot cooking is waiting for the pot to reach high pressure. Thawing the vegetables beforehand or using fresh rather than frozen will shorten the cooking time. Finally, it's easy to make this soup on the stove, but you should start with 4 cups of water and add more as necessary because more water evaporates in stove-top cooking. This makes 6 average sized servings (about a cup and a half) or 4 meal-sized servings (about 2 1/2 cups each). A large serving is 1 point on Weight Watchers Freestyle. Love the idea of using the bean liquid for more flavor! I’m also lazy, so less steps and less colanders to clean is always a plus for me. My poor Instant Pot hasn’t had a break since I got it. I have the Fagor, too, but I just didn’t use it like I have the IP. I wasn’t sure I’d like the stainless vs. the non-stick, but I LOVE it. Will be doing this recipe in the very near future! Oh how I love opening my inbox to a simple, healthy recipe I happen to have all ingredients for and that I can make tonight since DH isn’t too keen on the golden zucchini noodles with tofu and red peppers I planned on (although made with curry, he would probably go for it. He’s not a big fan of tofu). Thank you Susan. Congrats on Herman. What a story! So happy for him and your family. 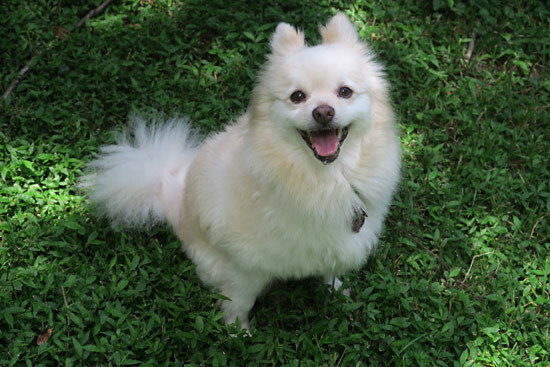 I love to send you a picture of our dog, Skippy. He is the ebony twin of your Herman. Thanks for this, Susan. I’ve been making your Dirty Little Secret Soup in my IP for some time, but having the specific timing here is very helpful. Like the Instant Pot, this recipe is a lifesaver — fast, easy, delicious, and good for you. Susan-Thanks for another great looking recipe. And, I’m so glad Herman got a wonderful home with you! Our dog, Piggy, had heartworms when we found her, & she also had to be kept very still for a very long time. But, the treatment worked, & she had 15 wonderful years! I hope Herman does just as well & I’m glad you adopted him! If I wanted to use fresh veggies, how many minutes would it take using the IP. Ps….your dog is SOOO cute and he is lucky you found him. Good luck! Thanks! Unless you’re using potatoes or other longer-cooking vegetables, 2 minutes should work. It will take less time to come to pressure (a good thing). If I were to use potatoes, do you think 5 minutes should work? If they are cut into 1/2 inch cubes, I think 4 minutes would be enough. The pot veg soup looks delicious, I haven’t made something like this in aaaages. I’ll probs make more like this coming into autumn now 🙂 thank you for sharing your recipe! When we took him to the vet we found that he actually IS microchipped. The vet had it traced and it was part of a batch sold to a clinic that is no longer in business. But it was never individually registered, so there’s no way to track the owner. I immediately went online to register it myself. Herman is so cute and soup sounds delicious. This recipe sounds lovely! I have thoroughly enjoyed your website for years and this is my first comment. Your crustless tofu quiche and carrot dogs are permanent recipes in my rotation. I love it! You also introduced me to the wonder that is making veggie soup with frozen veggies. Thank you, thank you, thank you! Also, welcome Herman! He’s so cute! Adorable dog! Congratulations on the new family member. Herman looks so happy in the photo. 🙂 I hope his heartworm treatment goes well. One clarification on the recipe (which is probably self evident to most readers but just checking… ): with the basil and oregano is that fresh or dried? I was assuming fresh herbs given the amounts involved but then wasn’t sure which you meant and wanted to double check. As with many (most?) of your followers I tend to improvise off of your basic recipes to adjust for family preferences but like to try it as written the first time through. Thanks as always for sharing your yummy and healthy recipes. Oops, I should have specified dried herbs (pressure cooking mutes the flavor, so I tend to use more.) Thanks for asking! I have a pressure cooker, will that work, and how long do I cook it? Thanks. Love your pup, God bless you for your loving kindness. Yes, just cook it for two minutes after it reaches high pressure and then do a quick pressure release. You can use an Instant Pot just like you would your stove-top pressure cooker for dried beans, there’s no difference. 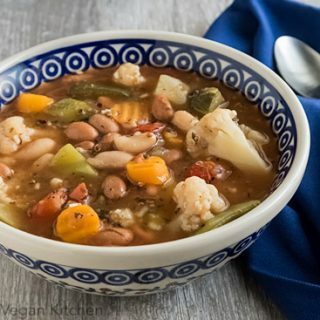 The reason I use canned beans in this recipe is because the vegetables cook fast, and to cook them at the same time as the beans, the beans have to already be cooked. I could first cook dried beans and then add the vegetables, but I was looking for a quicker, easier recipe to demonstrate the instant pot. Okay, that makes sense. I appreciate the explanation. I’m not interested in using canned beans, so I don’t see myself using the Instant Pot that way. But, I really need to learn how to use it, because it is just collecting dust. I would love to see a demonstration of a one pot recipe in the instant pot to get me started. I do cook beans separately all the time in my stovetop pressure cooker, but have no experience doing it in the instant pot, and ideally I do prefer recipes that can be done in one step, rather than cooking the beans separately. In ‘Great Vegetarian Cooking Under Pressure’ by Lorna Sass, there are many one pot pressure cooker recipes, and a lot of them include beans, but I really wouldn’t know how to do any of them in my instant pot. I only tried using the instant pot once, a long time ago, and I had some difficulty with it. I can’t remember what I tried to make, or what the problem was, but I did not find it to be idiot-proof, and since I like to learn by example, it would be really helpful to have an example I could follow that didn’t involve putting convenience items into the instant pot, which is something I would never, ever do with my stove-top pressure cooker. Right now, any examples would be very timely for me, because I’m having some issues with my stove-top pressure cooker, and will probably need to replace some parts. Actually, I originally bought the instant pot during a time when my stove-top pressure cooker was out of commission, but then once I got the issue resolved, and never really learned to use the instant pot, I went right back to exclusively using the stove-top pressure cooker. Claudia– I use my electric pressure cooker exactly the same way as I did my stovetop pressure cooker(s). I use it a lot more than I did stovetop because I can walk away, but my overall cooking methods are about the same. I’ve found that most recipes are the same but add a little extra time for electric pressure cookers since they cook at slightly lower pressure on high than a stovetop model. For myself, I usually take my favorite stovetop recipes and add 10% time, which is typically a couple minutes. I would recommend watching Laura Pazzaglia’s tutorials on the Instant Pot to feel more comfortable with how it works. I’m a very visual person so even though I find my fave recipes here and a few other sites, I refer to Laura’s hippressurecooking site often for the basic instructions or time charts. I’m still looking for ways to learn to love my IP. I like it for cooking spaghetti squash and artichokes, and I do use it for beans even though it takes much longer. If you eat oatmeal or other breakfast grains, I’ve heard that it can be nice for things like steel cut oatmeal or quinoa in the mornings. I figure I’m going to have to just make up my own recipes for it and learn over time how to use it best for our family. Good luck! Hi Susan! Thank you for this fast and easy recipe – I plan on trying it today. However, I plan to double it – have you every done so and do you have any cautions or recommendations for doing so? I love your site and all the delicious and easy recipes you share with us. Thanks, Teresa! For doubling, be sure to check the limits of your pressure cooker. This may be too much for the instant pot, which you shouldn’t fill more than about 2/3 full. I doubt it would fit doubled, though you might be able to get away with making 1 1/2 times as much. The timing at high pressure should be the same no matter the amount, but if you want to speed up the process, defrost the veggies first. Ha! This is too perfect! 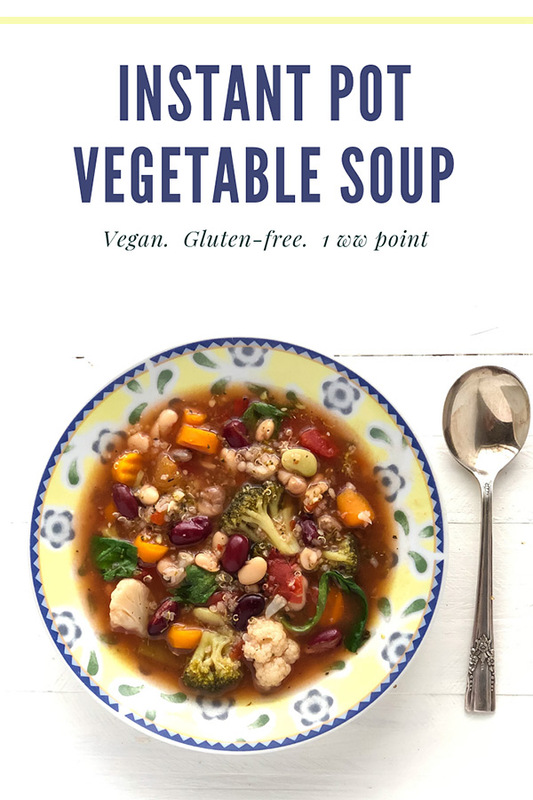 I had just decided to make vegetable soup -opened my inbox, and there’s a wonderful recipe thank you, thank you, thank you! I have had the exact opposite experience. When I first got my IP, the steam release knob was faulty. I took a video of it spurting water out the top, emailed customer service, and sent them the video. They put a new knob in the mail for me that day. Another friend had a problem, and they sent a whole new pot, never even asking for the old one to be returned. I have some quibbles with the way the IP works, but I’ve had good luck with their customer service. Oh I love Herman! Congratulations and thank you for giving him a good home. 🙂 I can’t wait to make this recipe! Hi Susan, we are a fan of your ‘Dirty Little Secret soup’; we like it with potatoes and barley. How would I do this recipe with potatoes? I’m new to the Instant Pot. Thanks. If you cut the potatoes small, you should be able to add them to the recipe without changing the time. If you’re adding them in addition to the quinoa and other ingredients, it might be best to use a little extra water, maybe 1/2 cup for every cup of diced potatoes. Thank you Susan!!! So very glad to hear from you as I miss your emails and recipes. I make your dirty little secret soup once or twice a week and it is different every time. I hand out that recipe to everyone I know. Our favorite. Now to learn to use my instant pot I bought before from your advice. So glad all is well in your life and Herman is adorable. Your recipes and Mary McDougals are my favorites- reliably good and easy. Thank you so very much for all your hard work and generosity for us all to enjoy a better life!! You are appreciated!!! Let it be noted that I was the one that dragged you out to CARA to adopt Herman and he loves me more! Well, that was surprisingly flavorful for such a simple recipe. Only addition was stirring in nutritional yeast at the table. 2 thumbs up! This was DELICIOUS!!! I did not have the specific types of veggies/beans so I used a 32 oz bag of generic grocery store frozen vegetables and 2 cans of beans (pinto + kidney) and it was gobbled up quickly 🙂 Thank you! I’ve been trying to get my family to go vegan. Making small progress. There are actual vegetables in their diet now. I’ll take my victories where I can find them. This soup is awesome! Looking forward to a bowl of it each day this week! Hi Susan! This recipe looks great, and I am always looking for new instant pot recipes. How necessary is the hot sauce? I have a daughter who hates anything spicy (even though all the rest of us love it!) but I don’t want to sacrifice flavor. Should I substitute anything else in its place? I would just leave it out. You can add more of the other seasonings if you want and also those who like spicy food can add hot sauce at the table. I expected this recipe to be good but I was surprised that it was excellent! I needed something quick for dinner as I had to get going for a parent night at my children’s school. I threw all the ingredients right into my regular Dutch oven and it worked perfectly. Thank you so much for the recipe! I was wondering which size serving your nutritional information refers to, the 1.5 cups or 2.5 cups? It refers to 6 servings of about a cup and a half each. The exact size of the serving will depend on how much water cooks off. Thank you for a great recipe. I love my Instant Pot, especially for beans and other veggie dishes. One of my favourite ones is Ratatouille http://www.cooksandcookers.co.uk/recipes/ratatouille-healthy-delicious/ Do come and visit. I hope you like it :-). Chris, I’m so glad you enjoyed it! Be sure to check out the rest of my pressure cooker recipes: https://blog.fatfreevegan.com/tag/pressure-cooker They all can be made in the Instant Pot. I came here to check out your recipe only to be distracted by your dog. Soooo cute! Use the Cholula. I find it to have a much smoother flavor than Tabasco. Hi Susan, my name is Sri, i have been following your recipes and i really like the way you make the Indian dishes oil free, and i love the Pressure cooker/instant pot recipes, i have tried quite a few of them and they became a staple in our weekly lunch and dinners. Just wanted to say thank you for sharing them with us. Take care and enjoy having Herman, hope he gets better soon. Thanks so much for your kind words, Sri! I’m so glad you like the recipes. And I’m happy to report that Herman is doing great! Thank you for this recipe Susan, I was looking for a soup recipe for yesterday’s dinner and I saw this and tried it, It was really perfect and my family loved it so much. I will definitely do this again. I just got my Instant Pot today and this was my first time cooking with it. The recipe was easy to follow even for a total beginner, and the soup came out amazing! Thanks for this awesome recipe! It was a big hit and the perfect meal for a cold, stormy evening. I will definitely make it again! I’m excited to try this recipe. Can I substitute bulgar wheat for the quinoa? I’m not a big fan of quinoa. Yes! Bulgar is a great substitute. This soup looks great! I have a bunch of kale I need to use. Would you recommend adding it after the 2 minutes, maybe cooking at pressure for an additional 1 minute or so? Thank you for all of these recipes! I would add it after the two minutes but just cover the pot and don’t bring back to pressure. There’s still so much heat after pressure cooking that the kale should be cooked in a few minutes. If it needs more, you could always turn on the keep warm setting. Hi! Can’t wait to try out my new electric pressure cooker with this recipe. Looks like a great way to ease into it. Could I use uncooked brown rice instead of quinoa with the same cooking time? Thanks! If you want to use brown rice, you’ll need to cook it first. Quinoa only takes a couple of minutes to cook in the pressure cooker, but brown rice takes about 25. Your vegetables would be mush before the rice got cooked. Awesome ..looking yummy.. i will definitely try this .. thanku for sharing this recipe with us. You mentioned cooking potatoes in the IP ahead of time so you have them on hand. Do you freeze them after cooking? I’ve never frozen them, just refrigerated. Tried this tonight. Well, it started out that way. I used veggies, canned beans, quinoa, instant pot. Then it morphed. I used all fresh veggies…totally different from what you had. Mine included bell peppers, onion, yellow squash, fresh tomatoes, a whole bag of baby spinach, a can of field peas and one of butter beans. I can’t follow a recipe to save my life! I used the same amount of time, but I added the spinach with everything at the same time…and used just over a cup of boiling water. ABSOLUTELY DELICIOUS!!! This made me laugh out loud! Thank you. It’s been a hard week. I am so happy right now. I made this soup for lunch and it was delicious. I and my grown daughter did not expect to actually like it. After all… it IS a vegetable soup. But we were both delighted and I will certainly make it again. Thank you for such a great recipe. I pureed part of it to make it creamy. Just because my new immersion blender is now attached to my hand and I’m pretty much pulverizing everything in my path. Great recipe, good mix of spices. I added leftover Yukon potatoes. Cooked on the stovetop and will definitely make again. I loved your blog for some years now and want to thank you for your dedication and creativity. My husband and I love the flavor of this soup. But I do have a question. I have a Deni electric pressure cooker and when I tried this recipe for the first time, it could not get to high pressure automatically. After what seemed like a ridiculously long time, I finally did the manual release. Everything was cooked–even a little charred. I went back and read the Deni manual and it seems that the problem was not enough liquid for the amount of solid food. Are all electric pressure cookers different with regards to the amount of water needed? Do you have a suggestion for adjusting? Next time, I think I will try cutting the recipe by half and using more liquid. Any thoughts on this? I’m sorry about that! It does sound like your pressure cooker has different requirements for water than the Instant Pot. I think your solution is a good one. You could also try making it as written but put only half the beans and vegetables in during the pressure cooking and then add them after you release the pressure, allowing them to warm in the soup for a few minutes. We had this soup for dinner tonight. Very easy and quick introduction to the Instant Pot as my first-time use. I always drain the cans of beans, so I added extra water. Instead of water, next time I’ll use vegetable broth. A nice and warming soup! Hi Susan, Thanks for another great recipe and also thanks for the video, first time I ever got a really clear idea about instant pot vegetable soup. I just got my Instant Pot and remembered your video. This was SO easy, just dump everything in& set the timer. Yummy! Thanks Susan for another winner. I found this recipe last week and have already made it twice for my family. We LOVE it!! This was a great tasting and easy recipe. Thanks so much! Thank you!! I made this recipe for my sick hubby, with some minor modifications. Hubby loved it and I can’t believe how quick and easy it was!! !